Great example of tissue samples showing the various grades of AR. Rhinitis is inflammation of the tissues inside the nose and in its mild form it is very common. During the process of infection the delicate turbinate bones in the nose become damaged and may shrink or become distorted (atrophy). It is recommended that pigs be vaccinated to prevent AR. 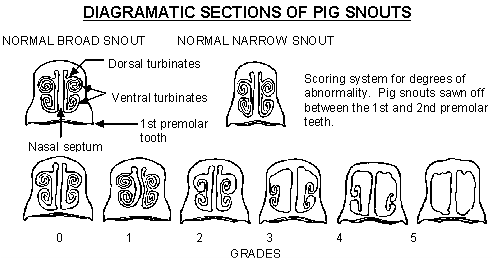 The distortion of the snout doesn't happen to all pigs with AR, typically the most severe have the visible signs though. If your piggy exhibits chronic runny eyes and nose, perhaps with sneezing, and/or nose bleeding, she may have Artophic Rhinitis (AR). Now, don’t freak out. Fifty percent of all commercial pigs have mild AR and do just fine. It is only in severe cases that the nose becomes disfigured and twisted. 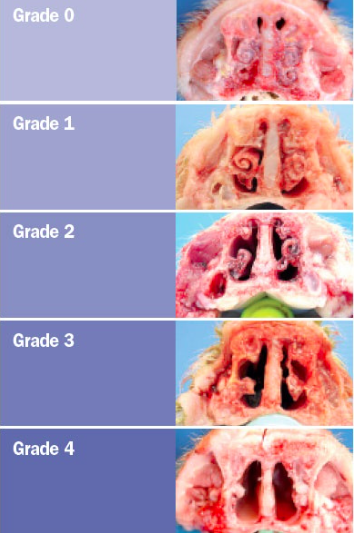 When this damage to the turbinates (a sophisticated filtering structure within the nose) occurs, pigs are more prone to respiratory infections and will not be as thrifty. AR is caused by two bacteria, Bordetella bronchiseptica and Pasteurella multocida. 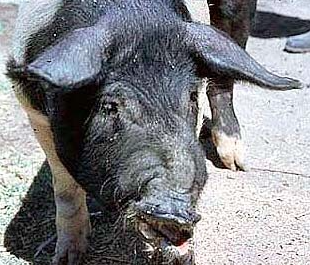 This infection is primarily transmitted from the sow to her offspring. The secondary avenue of diffusion is through the air, or aerosol spread. If breeding animals have been properly vaccinated against rhinitis, you adhere to a rigid and complete vaccination program for offspring, and your animals are not exposed to unfamiliar swine or environments, one could control this problem. Preliminary diagnosis can sometimes be made from a nasal swab, though it is nearly impossible to make a positive diagnosis of rhinitis without a postmortem. Consult your veterinarian if you suspect AR. Your pig could simply have allergies. Allergies are manageable and you can speak to your vet about what treatment is most appropriate for your pig. Photo courtesy of Google image search. This is a full sized pig that was affected by Artophic Rhinitis. You can see the distorted snout.